The Islamic flag is hoisted at the auspicious moment. Ven. 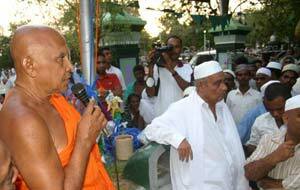 Dr. Aluthwewa Soratha Thera (at left) addresses the Kataragama Flag Hoisting on 15 July 2007. The 2007 Kataragama Esala Festival officially began on July 15 with the Flag Hoisting ceremony at the Kataragama Mosque & Shrine. Kataragama Mosque & Shrine Trustee M.H.A. Gaffar presided over the colourful gathering with Ruhunu Maha Kataragama Devale Basnayake Nilame Shashindra Kumara Rajapaksa as Chief Guest. 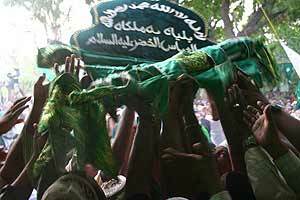 After recitation of prayers by bawas of the Refai Faqir Jamāt, the official green festival flag in Arabic lettering was hoisted with vigour at the auspicious moment by Muslim devotees, marking the start of the festival as each of those assembled cheered or prayed out loud in their respective language. The assemblage included Kirivehera chief incumbent Ven. Rev. Dr. Aluthwewa Soratha Thera, Kataragama Abhiramaramaya Viharaya chief incumbent Ven. Rev. Saranatissa, learned Muslim clergy and Hindu gurukkals, as well as Army, Police and other Government officials and devotees from all over the island and abroad. In his welcoming address, Gaffar Hajiya noted that "in the whole world Kataragama is the only place where people of all religions gather amicably without any friction or ill feelings." Ven. Rev. Dr. Soratha Thera observed that when Muslim traders came without womenfolk and arrived on Sri Lanka's shores long ago, they married local women, adopted local languages and customs, and thereby integrated themselves peacefully and established their lasting place in Sri Lankan society. Kataragama Basnayake Nilame Shashindra Kumara Rajapaksa likewise welcomed devotees of all communities to Kataragama and noted that Kataragama has long been a national symbol of unity and religious harmony, and as such is the common inheritance of all Sri Lankans.  The same theme of Kataragama's religious tolerance and ethnic harmony was addressed in turn by other dignitaries speaking for the Hindu and Muslim communities, and by officers speaking for the police and armed forces. The Kataragama festival flag remains hoisted until after the Water Cutting Ceremony on July 30 when it will be ceremonially lowered and stored, after which Muslims and non-Muslims alike will share a feast marking the successful completion of this year's festival. • "Kataragama is for all people"
• "Kataragama - The land of Khidr"
• "Flag-Hoisting Ceremony at the Mosque"
• "Muslim Pal Kudi Bawa of Kataragama"